What do you get when you go mucking around with the genetic make-ups of arachnids and aliens? Either a Nobel Prize or a ÂscreechinglyÂ' painful death according to this low-budget tale. 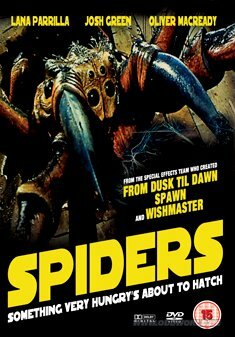 The story explores the adventures of several "too smart for their own good" science types, whose experiments with recombinant DNA lead to frightening consequences - namely, a herd of gigantic eight-legged critters with mandibles of steel and an appetite for human blood. As if that isnt enough, it seems that these hungry, hairy harbingers of the apocalypse need human hosts to incubate their young.